Obviously a Starring Rolls visit will be an absolute necessity if my wife lets me anywhere near that coma-inducing construction. I won't even try to guess the calories, but dollar-wise I'm assuming that the wee morsel is in the $4-$5 range? Chuck - You'd been right! The Red Velvet Cheesecake Cupcake is priced at $3.99 and counts as a snack credit for dining plans. No fair making me drool this early in the morning! 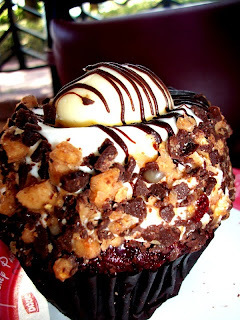 That is one "gotta have" cupcake!